Editor’s note: Over the next two weeks, we’ll feature posts around the final convening of our Chief Executive Program, The Summit at Sundance. We invite you to participate in an online discussion of four major issues facing the cultural field. In this post, Theresa Remick introduces the third problem statement. Problem to solve: Engage users/customers/stakeholders as true collaborators in shaping an institution’s agenda. Customers are shifting from passive consumers to active collaborators, and many desire experiences designed for and with them. Increasingly arts and culture organizations are seeking to be audience-driven by inviting customers into their process. We look to crowdsourcing as a means to achieve this type of engagement, and there’s certainly no shortage of organizations involving their customers in program design. Much emphasis has been placed on participatory experiences, and these are by no means without value. How often does this engagement extend beyond audience development initiatives or one-off programs? Are we asking our customers what they want simply to inform programming decisions that will put butts in seats, or so our organizations can become more representative of the communities we serve? Bringing users into our organizations should not happen only as a response to changing consumer preferences and habits. Nonprofit organizations receive tax-exempt status based on the promise that we will meet a need not being served by government or the private sector. Are we really delivering on that promise? Without a deeply engaged and mutually trusting relationship with our communities, how can we possibly know what needs aren’t being met? And, given that our mandate is derived from the interests of a variety of stakeholders, shouldn’t the entire organization – from mission and vision to programs and practices – reflect, and be inspired by, the community we’ve chosen to serve? At the Santa Cruz Museum of Art & History, Creative Community Committee (C3) meetings bring members of the local community together to brainstorm programming ideas. To do so, C3 members consider the needs of the museum’s constituents and how those needs might be served through community programs. 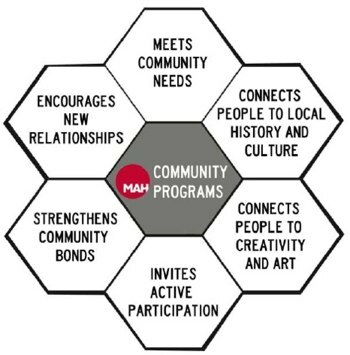 Keeping in mind the MAH’s goals for community programs, they use a honeycomb framework to identify needs, collaborators and projects that would help meet each need. By engaging a diverse group representative of its community, the museum can make better choices about how to serve Santa Cruz in a relevant and meaningful way. And while the MAH has used this process to inform program design, C3 meetings also give stakeholders a more prominent voice in the organization as a whole. 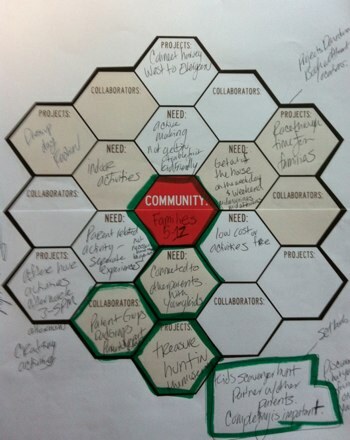 The honeycomb framework could easily be adapted to help an organization think about its community, and about how that community can inform its overall agenda. 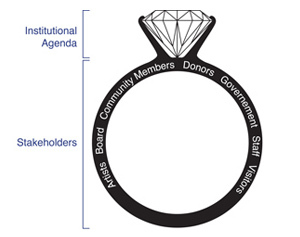 What will you do to make stakeholders the cornerstone around which your institution’s agenda is built?